G-622H 200 Channel UHF PLL Microphone System. Gtd-Audio's G-622 wireless microphone system delivers superior sound quality and professional features. It is designed for a wide range professional application with 200 selectable channels. For easy use with multiple systems, no confusing frequency groups. It can be placed next to speakers with no feedback or distortion. It is perfect for professional use at any events. Backlit LCD display showing RF level, AF level, Channel Frequency and mute status. 100 Selectable frequencies on each channel, up to 30 units can be used simultaneously. Built-In Tone Lock Squelch circuit protection from RF interference. Automatic frequency scanning to find and set the best available channel. Automatic transmitter setup, the channel of the transmitter and receiver can easily synchronize. 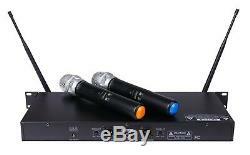 Dual channel receiver, Both microphones can be used at the same time. Two XLR individual outputs and one 1/4 Mixed output. Individual volume control on each channel. Frequency: UHF (550MHz - 590MHz for the US customers, comply with FCC new frequency rule). Frequency: UHF (620Mhz- 680Mhz for international customers). Battery Life: 12 Hours (AA batteries). Range: Up to 400 feet (150 meters). Rack mountable, Fits 19 rack. (1) Dual channel UHF receiver. 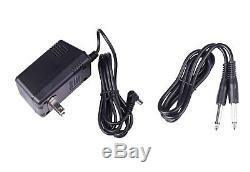 (1) AC-DC adapter (110V-240V universal). 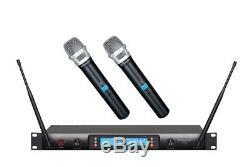 The item "GTD Audio 2x100 Channel UHF Wireless Hand Held Microphone Mic System 622H" is in sale since Saturday, August 18, 2012. This item is in the category "Musical Instruments & Gear\Pro Audio Equipment\Microphones & Wireless Systems". The seller is "microphone-usa" and is located in Catonsville, Maryland. This item can be shipped worldwide.